Taking a little break from the gorey Halloween looks today! If you follow me on Instagram, you will already see that I am a big fan of the Makeup Addiction (formerly Hair and Makeup Addiction) brush sets, and I'm really pleased to finally try out some of their newer makeup products, including their loose pigments. I also used the Makeup Addiction 'Ultimate Eye Set' brushes to apply this, as they are the newest addition to my brush collection and I just couldn't wait to use them. 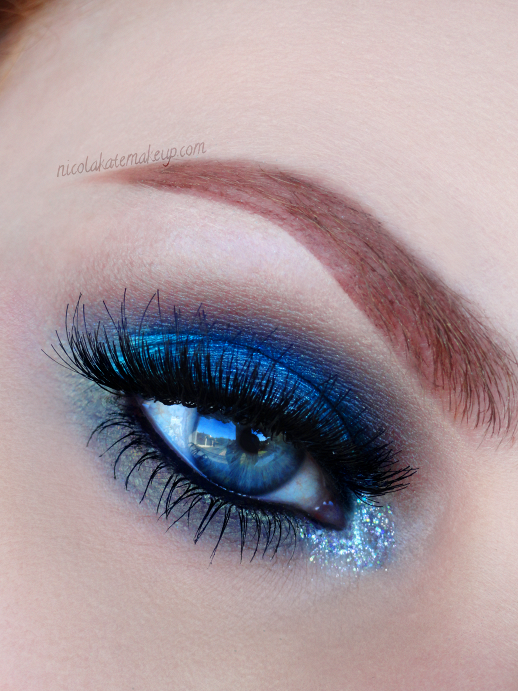 The pigment that I used all over the lid is actually a stunning peacock green shade, but my lighting captured it as more of a vivid blue shade, but still looks so pretty! I'm also really loving these super dense double lashes from Girls With Attitude, which are essentially two pairs of strip lashes already pre-stacked for you. Copyright © 2013 Nicola Kate Makeup. Powered by Blogger.